Preheat the oven to 350°. Line a 9-inch glass pie plate with 1 rolled-out round of the Flaky Pie Crust. Trim the overhang to 1 inch, fold it under itself and crimp decoratively. Refrigerate until chilled, about 15 minutes. Line the pastry with foil and fill with pie weights or dried beans. Bake for 30 minutes, or until nearly cooked through and dry to the touch. Carefully remove the foil and weights. Bake for 10 minutes longer, until golden. Let cool completely. Meanwhile, set a fine strainer over a medium heatproof bowl. In a medium saucepan, combine the milk with 1/2 cup of the sugar, the flour and salt; whisk until smooth. Cook over moderate heat, whisking, until the mixture is the consistency of sour cream, about 8 minutes. Put the egg yolks in a bowl and gradually whisk in 1/2 cup of the hot milk mixture. Whisk the egg mixture in the bowl back into the saucepan and cook over moderate heat, whisking constantly until thickened, about 2 minutes. Strain the custard into the heatproof bowl. Stir in 1 1/4 cups of the coconut and the vanilla. Press plastic wrap directly onto the custard and refrigerate until chilled. Spoon the custard into the baked pie crust and refrigerate for at least 2 hours. Preheat the oven to 350°. In a large, stainless-steel bowl, using an electric mixer, beat the egg whites with the cream of tartar at medium speed until frothy. Increase the speed to high and beat until firm peaks form. Add the remaining 1/4 cup of sugar, 1 tablespoon at a time, and beat until glossy. Spoon the meringue onto the custard, spreading it to the edge of the crust and swirl decoratively, using the back of a spoon. Sprinkle the remaining 1/4 cup of coconut on top. 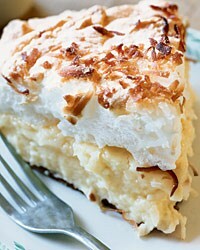 Bake until the meringue is golden and the coconut toasted, 7 minutes. Let cool, cut into wedges and serve.